JVS cement manifolds are designed and manufactured to suit customer requirements and are offered with a wide range of hammer union ended connections. The cement manifold consists of plug valves, forged tees and crosses. Manifolds are available up to a pressure rating of 15000 psi. JVS cement manifold are supplied fully certified in accordance with the recognized oilfield equipment standards. JVS has an in-house team to carry out onsite welding, PWHT, X-ray, pressure testing and inspection for offshore and onshore installation. 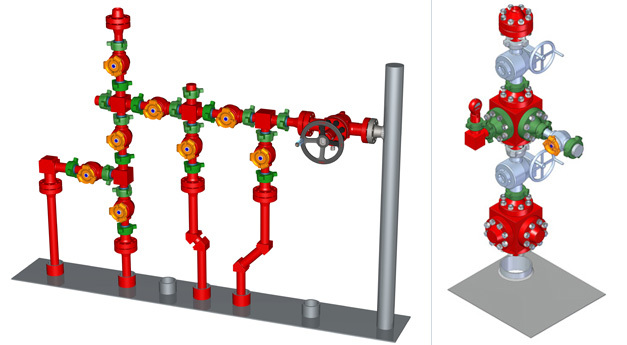 This facilitates the installation of the manifold and all associated high pressure piping starting from the cementing unit up to the manifold, providing complete system installation capability.